Now, the share of Americans who said they definitely wouldn’t vote for Obama did increase as the election got closer, but it only it only hit 40 percent or higher in two polls in our data set, which runs through about 250 days before the election.8 With Trump, on the other hand, close to 50 percent of Americans have already said they definitely wouldn’t vote for him even though we’re still more than 600 days away from the election. Yes, the combined percentage of Americans who said they definitely wouldn’t and probably wouldn’t vote for Obama cracked 50 percent on several occasions — though Obama won 51 percent of the popular vote in 2012, so he probably changed at least a few minds before Election Day — but the percentage who said they definitely wouldn’t vote for Obama was never higher than 42 percent in a single poll, whereas Trump’s number is currently about 48 percent, based on an average of the three most recent polls. Trump also has about half as many voters in the more persuadable “probably” camp, which suggests he has less wiggle room than Obama did. 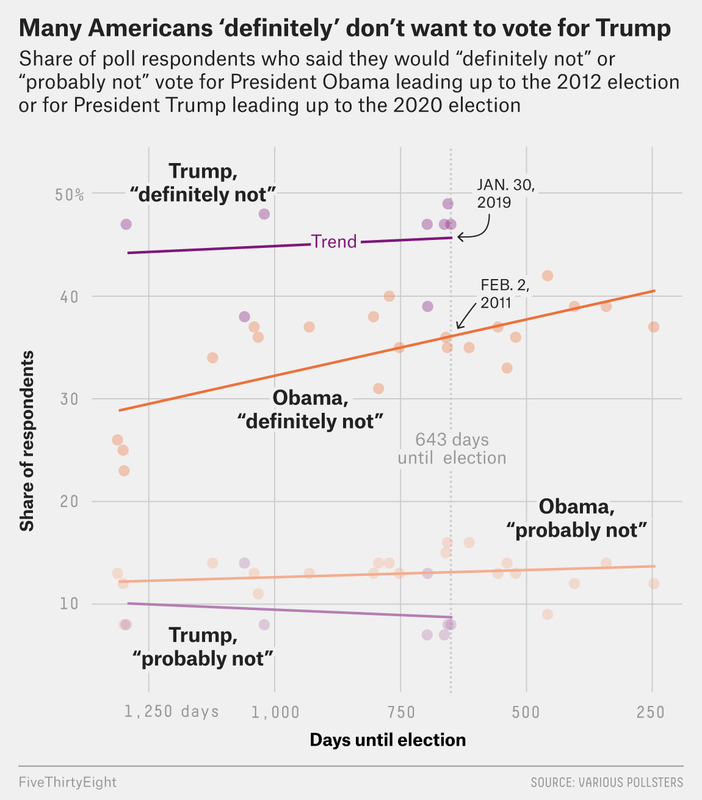 With combined opposition in the mid-50s, including more voters seemingly dead set against him than felt the same about Obama, Trump may have a lower ceiling of potential support than Obama did in 2012. Trump only narrowly won in 2016 while losing the popular vote, so once again he may have little room for error. The partial government shutdown that started Dec. 22 came to an end last week after Trump agreed to sign a bill funding the government for three weeks without the money he had requested for a wall on the U.S.-Mexico border. But while Trump is still hoping that Congress will fund his proposal, another shutdown remains unpopular. According to a Politico/Morning Consult poll, only 31 percent of voters said they would “strongly” or “somewhat” support another government shutdown over the wall funding. Fifty-nine percent of voters said they were “strongly” or “somewhat” opposed. If Trump and congressional Democrats fail to come to a border security agreement in the next couple of weeks, 48 percent of Americans said in a Monmouth University poll that the parties should agree to fund the government through the end of the year without a deal. Twenty percent said they should shut down the government until a deal is reached, and 26 percent said they should extend the temporary funding and keep negotiating. Asked about the idea of Trump’s declaring a national emergency to build the wall, 64 percent of respondents said they disapproved, while 34 percent said they approved. An AP-NORC Center for Public Affairs research poll found that 63 percent of Americans disapprove of how Trump has handled U.S. foreign policy while 35 percent approve. The poll also found that Americans were split on Trump’s decision to remove 2,000 U.S. troops from Syria — 39 percent of respondents said they approved, while 35 percent said they disapproved. When asked about what types of issues would make them more or less likely to support a candidate in the 2020 presidential election, 57 percent of Democrats told Politico/Morning Consult said they would be “much more likely” or “somewhat more likely” to support a candidate who backs “Medicare-for-all” (“where all Americans would get their health insurance from the government”) over improving the Affordable Care Act. In that same Politico/Morning Consult poll, Democrats were split on whether they supported more immigrants coming to the U.S. — 31 percent of respondents said they would be “much” or “somewhat” less likely to support a candidate with this stance, while another 31 percent said they would be “much” or “somewhat” more likely to support such a candidate. Meanwhile, only 25 percent of Democratic voters said they would be “much” or “somewhat” more likely to back a candidate who supported abolishing the federal Immigration and Customs Enforcement agency. The Glengariff Group tested some hypothetical 2020 presidential matchups in Michigan, which Trump carried by just 0.2 points in 2016. The poll found potential Democratic nominees with more support than Trump: Joe Biden (53 percent to 40 percent), Kamala Harris (47 percent to 42 percent), Bernie Sanders (52 percent to 41 percent) and Elizabeth Warren (46 percent to 43 percent). A Quinnipiac University poll found that 70 percent of voters believe transgender people should be allowed to serve in the military and that 22 percent were opposed. Among Republicans, that divide was 40 percent to 50 percent; among Democrats, it was 94 percent to 3 percent. Trump has sought to ban transgender people from serving, although the policy remains hung up in the courts. According to FiveThirtyEight’s presidential approval tracker, 39.5 percent of Americans approve of the job Trump is doing as president, while 55.9 percent disapprove (for a net approval rating of -16.4 points). That’s essentially the same as a week ago, when 39.5 percent of Americans approved of the president and 55.8 percent disapproved (a net approval rating of -16.3 points). 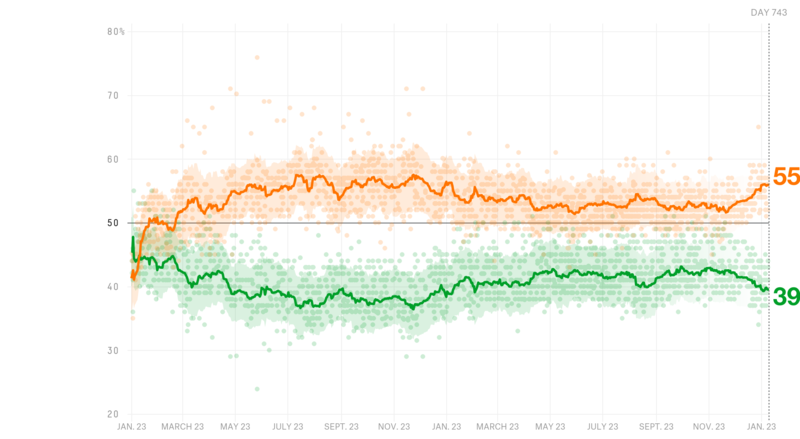 Trump’s net approval rating has dropped significantly from a month ago, when it was -11.9 (approval rating of 41.5 percent, disapproval rating of 53.4 percent).